But in case you missed the Kafkaesque beauty of the launch live stream on Gametrailers and Spike TV or were just too confused by all that happened, here are the key moments of the big event. Enjoy. Kicking off the show was none other than Geoff Keighley and two Sony executives, neither of which were Mark Cerny. They looked out upon the vast crowd of tens upon tens of people freezing in a wintery New York evening and fed their starving bellies with the focus group-crafted promise that #GreatnessAwaits. After a pleasant walk down memory lane, Sony President Shuhei Yoshida and Sony Head of Public Relations and Giant Bomb Dot Com's Best Friend Adam Boyes were in bed together as they acknowledged that The Last Guardian does still exist. Shuhei was asked whether he had played the game with his own two hands, and he stared in confusion at the absurd appendages in front of him, unable to answer their mysteries. Sucker Punch developer and college professor who has long since given up, Nate Fox, arrived to announce that inFamous: Second Son would be coming out March 21, 2014. He then lowered his hand as he stared off into the distance, acknowledging the sad fact that all of this was but an elaborate farce. For nothing quite makes people want to escape into a hopeful world of gaming excitement where they're made big and powerful more than being reminded of just how little they really are in the dark and soul-crushing world around them. Abandon all hope, and pick up the controller. Naughty Dog groaned and squealed in pain as a new Uncharted game slithered from their tired womb. A young boy named Joey came up from the rough streets of the Bronx to lay first claim on an entertainment parallelogram full of corporate promises and launch games but devoid of the human love and comfort he truly needed. Spike TV attempted in vain to convince the world that Criss Angel is still alive and not just Kim Kardashian's mother, Kris Jenner, when she occasionally dresses up as a gothic teenage boy from the 90s in her free time. Hideo Kojima disappointed people with his "mind-blowing" reveal that little has changed in the last 15 years of Metal Gear Solid. With that in mind, he regurgitated a new exclusive mission for the PS4 which will allow you to play as classic Solid Snake from MGS 1 and save the DARPA Chief all while wondering whether they will redub him with a younger, possibly cheaper actor. Ouya executives audibly cried in despair as their one great hope in the former exclusive, Towerfall, was announced to be coming out soon on Sony's joy and complacency monolith, the PS4. Throughout the night, Geoff Keighley was a charming and professional host with the twisted heart of a monster crying out behind the glassy spheres of his eyes. A lust beckoned in pained screams for unknowable things that would likely drive a normal man to madness at the mere mention, but to their fortune and its despair, no one could hear the wretched calls beneath a sponsored husk of blood and sinew. Now some memorable moments in pictures. A Photoshopped Shuhei Yoshida was revealed to always be watching at every PlayStation launch event ever held. According to Sony, he is even watching you now. When Geoff Keighley gazed long into the new PlayStation Camera with eye tracking, the new PlayStation Camera with eye tracking also gazed into him. Okay, okay. They didn't really show the PS4 getting shot, but wouldn't that have been cool? I mean, how amazing would it have been if Mark Cerny had come out with his big ol Knack-sized balls, exclaimed, "I brought you into this world, and I can take you out of it!" before shooting a .50 cal rifle right into a PS4? The young boy, now a man, named Joey touched the PS4 and suddenly felt the spirit of Antonio Banderas come upon him in a moment of sheer ecstasy. The clattering of keys could be heard long into the night as all of NeoGAF exploded in glee. Then the Grinch snickered and snackered. They're finding out now that no PS4 Launch is coming. Then the commenters in the forums will all cry, "Dammit! Muther...!" That's a noise, (the Grinch said) that I simply must hear! So he paused, And the Grinch put a hand to his ear. And he did hear a sound rising over the Internet. Was singing! Without any PS4's at all! 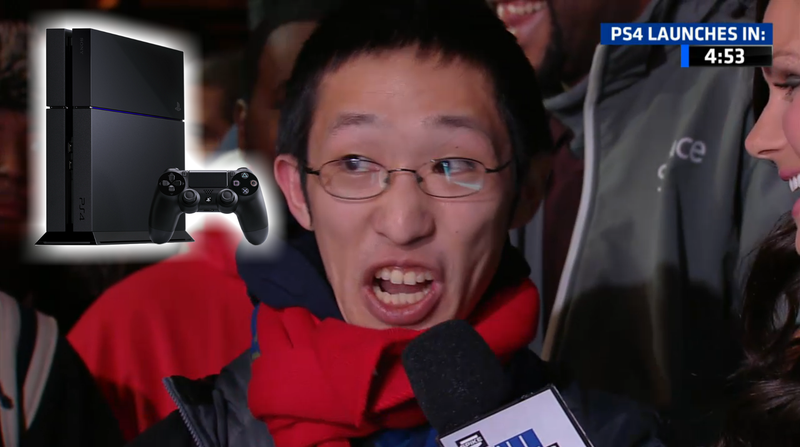 He HADN'T stopped the PS4 Launch from coming! IT CAME! It came without preorders! It came without gamertags! "Maybe console launches," he thought, "don't come from a store. Maybe console launches… perhaps… mean a little bit more." Happy PS4 Launch Day everyone!